Bath is, I must admit, my favourite city in the whole of the UK. In fact, I have actually thought about moving there. It's a historic city, the only one in the UK to be designated a UNESCO world heritage site, and this mixed with the beautiful Georgian architecture, the fabulous restaurants and eclectic mix of independent shops and well-known chains make it a must visit city. 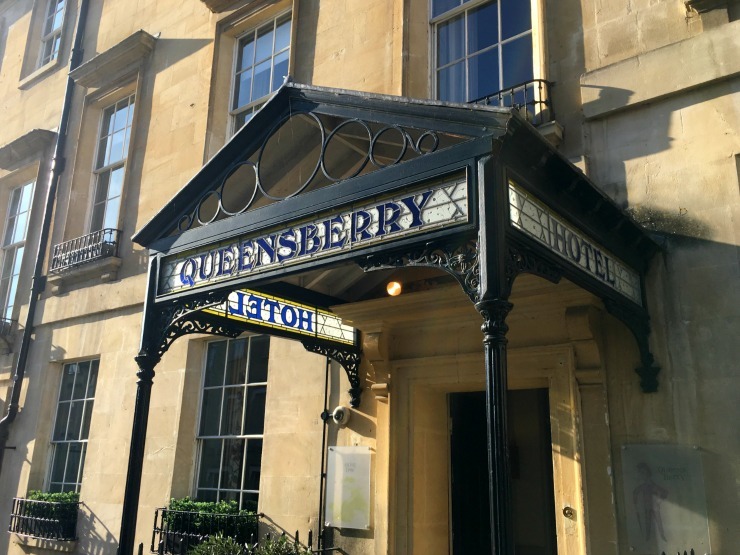 Just a couple of streets away from the main shopping area is The Queensberry Hotel. 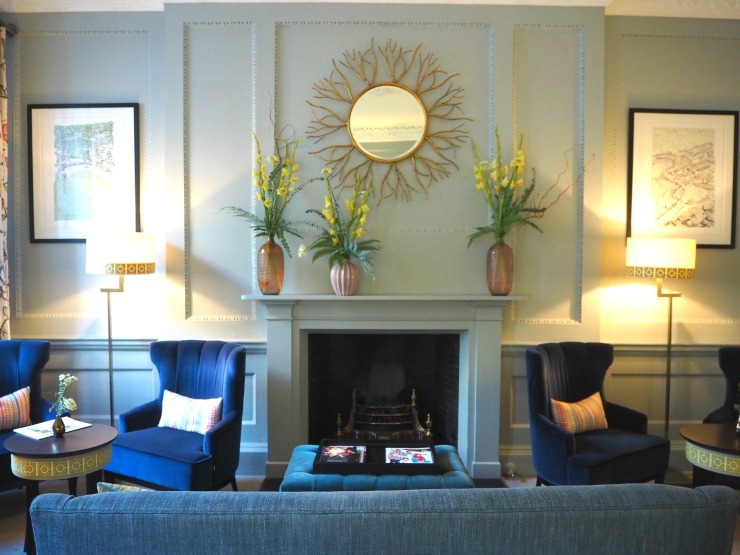 I've wanted to stay here for a while, as its reputation precedes it, so when I was offered to review it and report back to my readers, in exchange for a complimentary stay, it wasn't hard to say no. I just hoped it lived up to my expectations. Tammy on reception couldn't have been more delightful. She took our bags from us and informed us that our room wasn't ready yet but we could have a drink in the lounge or we could explore Bath. She also took our keys and valet parked our car for us. So we left our luggage and went to explore. When we returned at 3pm we were shown to our room. Our room, room 30, was at the top of some winding stairs. 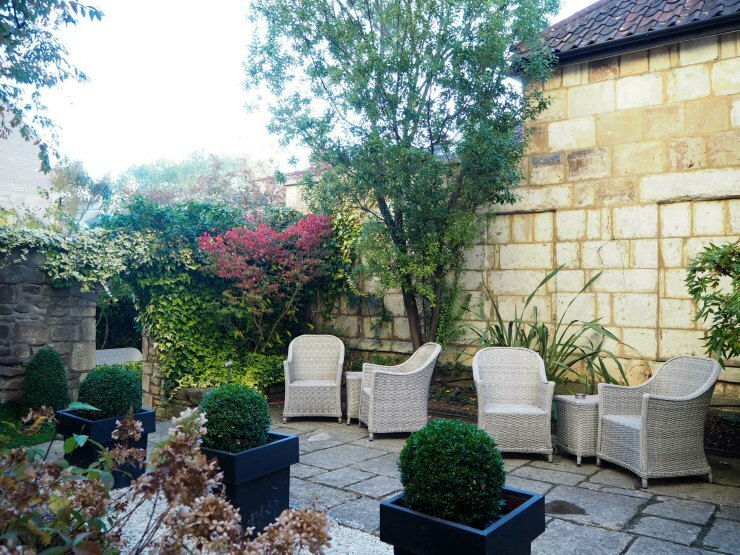 The hotel is four original buildings now made into one and it adds to the charm and individuality of the property. As it is a listed Georgian building, not all rooms are accessible if you have mobility problems, although some are via a lift. It's worth ringing ahead to get an accessible room if this could be an issue. Our room was large and spacious, with a comfy seating area, full-length ornate mirror, fitted wardrobes, a dark wood chest of drawers and a flat screen TV. 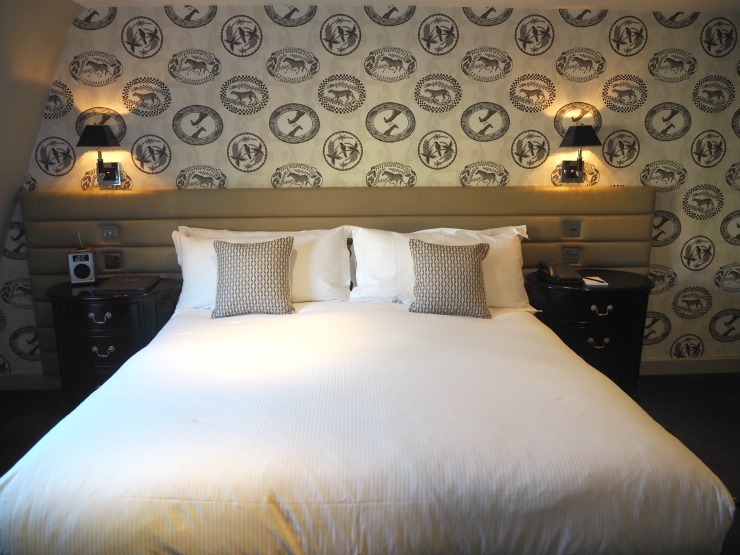 In the centre of the room was a large king sized bed (by Harrison Spinka) with a padded headboard and the room was decorated in chic shades of grey and white, with a dark blue carpet. The feature wall with animal print wallpaper added a unique touch and brought the room up-to-date. 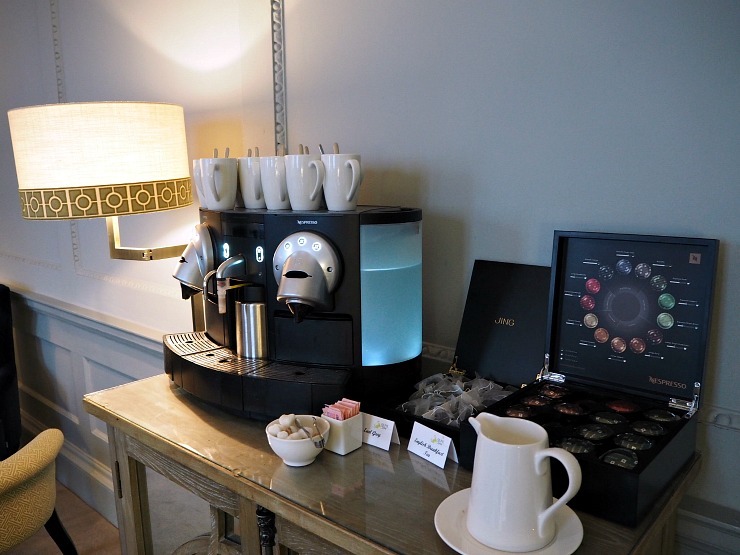 It was the sort of room that immediately impressed with the luxurious details, such as the design features, complimentary water and chocolates and an air of elegance. A little bit cheeky and quirky but still contemporary and delicious. 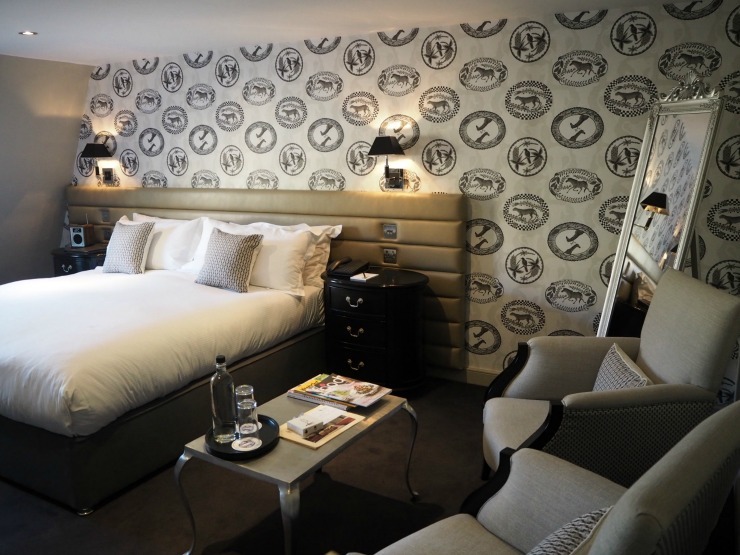 They say that all rooms are individually designed and you can view some of the rooms on their website if you are nosey like me! Check out the suites, they look gorgeous. 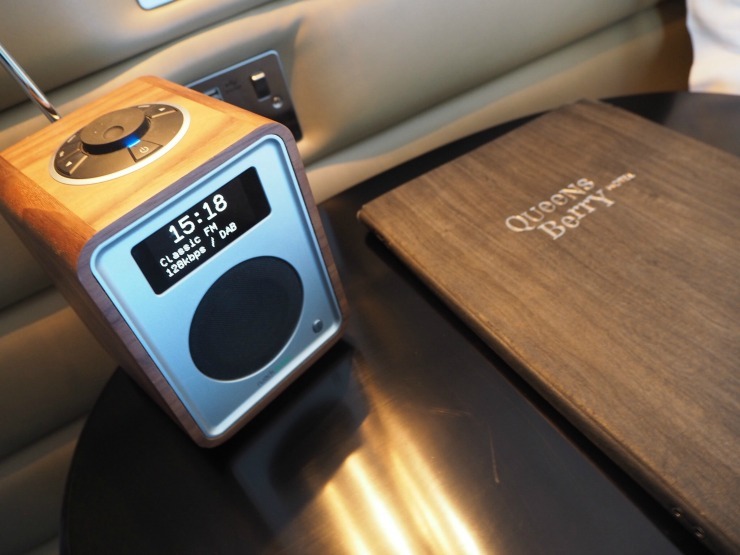 Classical music was playing when we entered the room, and I noticed Classic FM was selected on the DAB radio - so relaxing. Something I liked about the room was that there a number of plugs as well as USB points, which I feel is so important these days. The lighting was excellent too, being bright enough to work, but also adjustable for an evening glow. 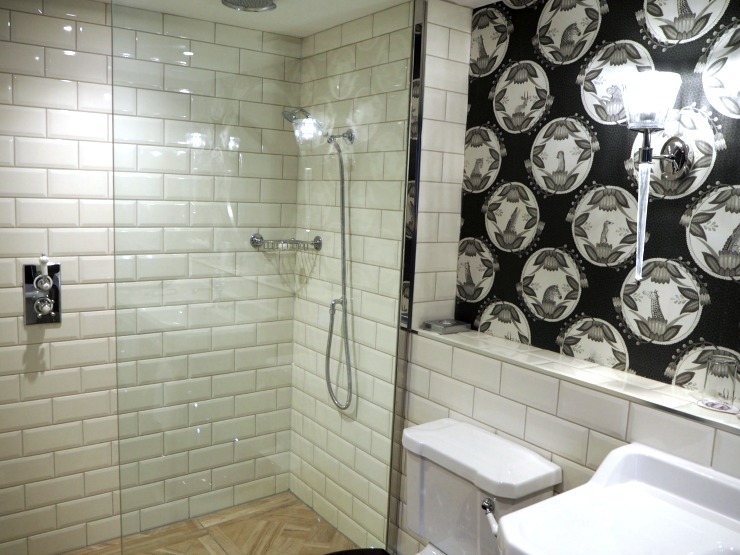 The bathroom really had that wow factor! The bathroom was made up of a huge freestanding slipper bath with a window view on one side, a large white porcelain sink in the centre and a spacious rainfall shower on the opposite side. The wallpaper in the bathroom with an animal print was really cute. 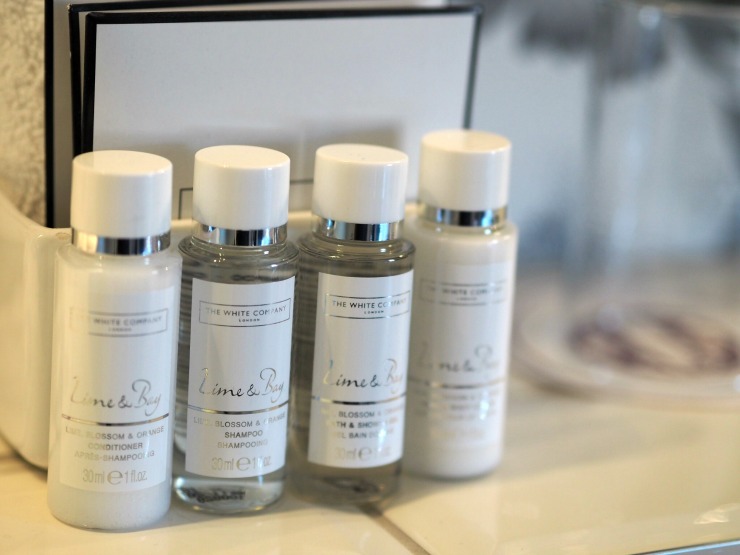 White Company toiletries, as well as plush robes, added an air of comfort and quality. So after we unpacked, we decided to go and explore the rest of the hotel. The lounge downstairs, next to the reception area is lovely and welcoming, and a selection of magazines and newspapers were available to read. Complimentary tea and coffee are available here at all times, and fresh milk was also provided - they even brought soya milk when asked. It was nice to sit here and chat over a cup of coffee with Mr W.
A few steps away is the Old Q Bar area. 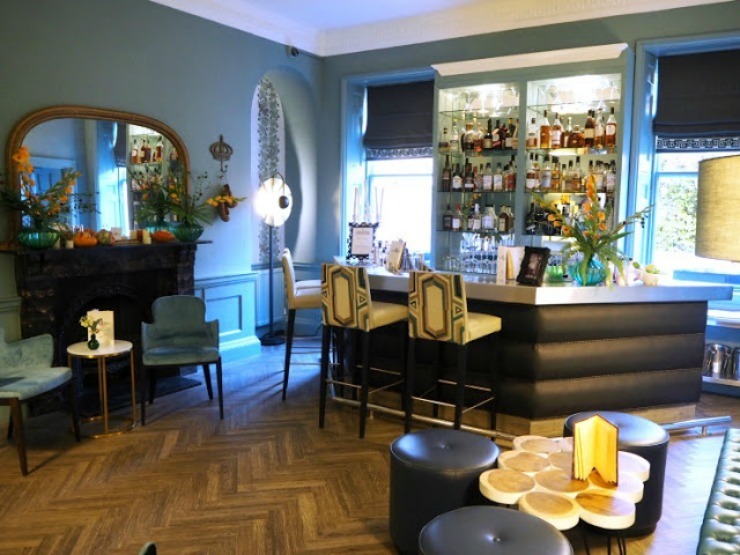 A smart snug bar, small but perfectly formed and with another lounge to sit with your drink close by. Sandwiches, snacks and hot drinks can be ordered here, I liked the sound of the fish finger sandwich with tartar sauce and skinny fries, yum! 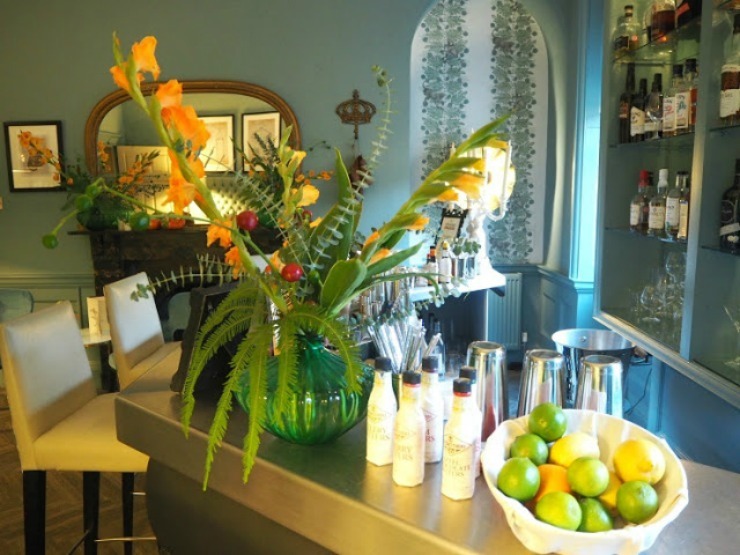 Drinks included a range of wine by the glass and bottle and the usual spirits. I noticed locally produced drinks on the menu too like the Bath Ales Golden Hare ale. Cocktails looked good, with lots of classics like Margaritas, Daiquiris, Martinis and more so we decided to come back later and try one. It was a sunny day so I decided to have a look around outside. When I explored more I noticed there were three areas to sit, and which would be lovely with a coffee or a glass of wine on a warm day. It was starting to get later in the day now so I retired to my room and indulged in the chocolates they had left us. It wasn't that long before it was time to get ready for dinner in The Olive Tree Restaurant in the hotel. As I was getting ready a couple of things I noticed a couple of design features. In the bathroom, there was a sensor light that came on when I entered and in the wardrobe, lights had been built in that came on as you opened it. Genius. 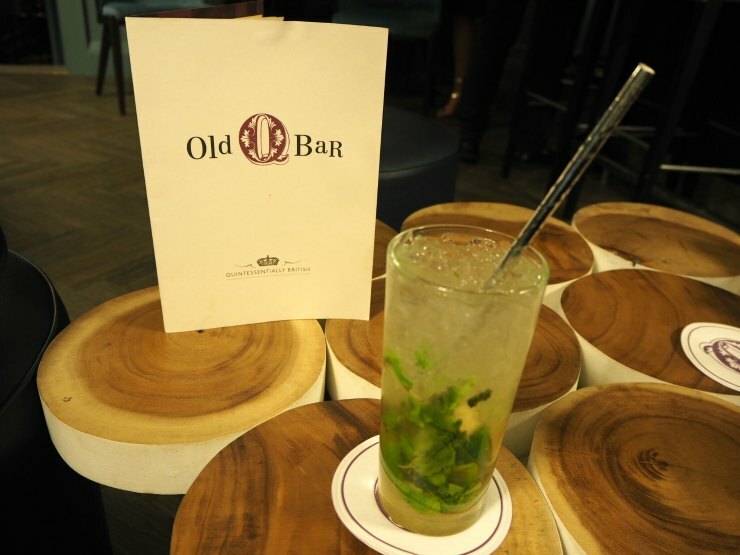 So just before dinner, we went back down to the Old Q Bar where we decided to have Mojitos. They were made to perfection, not too sweet, with a good balance of sharpness from the lime. Then it was time to head to the Olive Tree Restaurant. 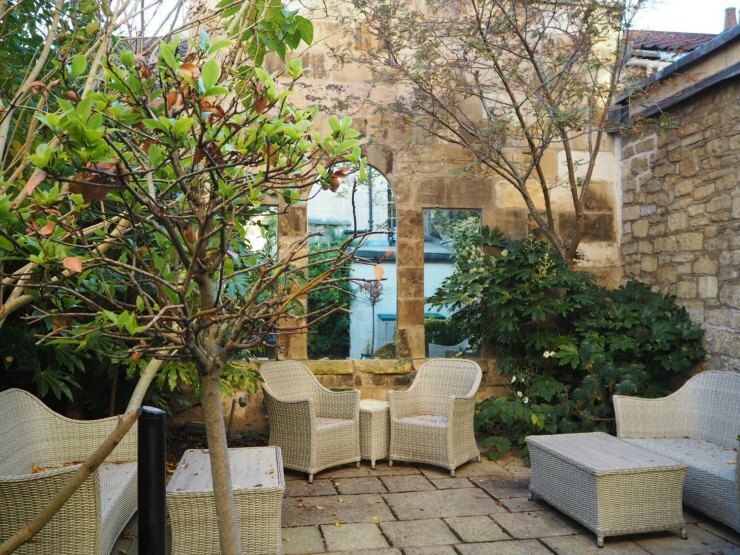 The Olive Tree Restaurant is in the basement of The Queensberry Hotel and is a cosy little restaurant. The food here recently was awarded a one Michelin star for its cuisine so we were in for a real treat. What I noticed immediately was the warm and friendly service, it felt like a special occasion restaurant, and everyone was dressed up but it had an unstuffy ambience which I was pleased about. Gitana showed us to our table and presented us the menu. 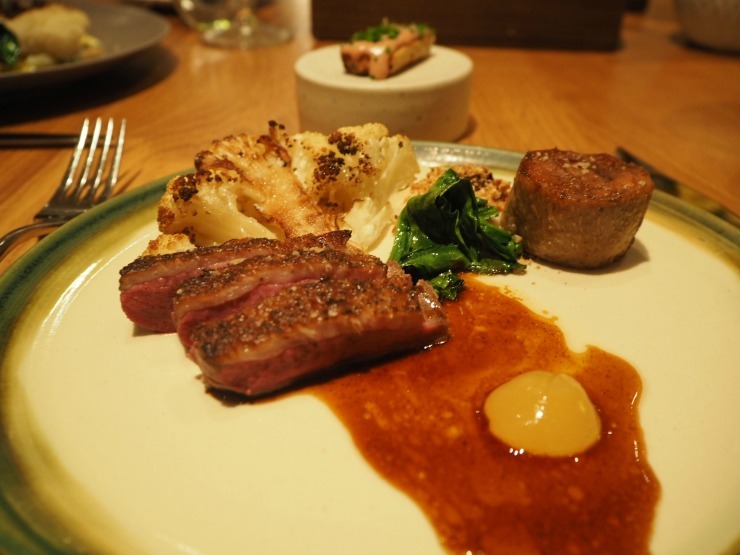 The head chef is Chris Cleghorn, who has worked under the illustrious Michelin Star chefs Heston Blumenthal and Michael Caines, so expectations high, we went for the 5-course tasting menu. Mr W had the vegetarian option whilst I had the standard menu above. I noticed on the website there was a vegan tasting menu as well as a dairy-free menu too. As with all the best restaurants, the produce is locally and lovingly sourced, with Walter Rose in Devies and Everleigh Farm in Wiltshire providing meat as well as the Eades family farm the vegetables. We browsed the wine list, which was extensive and had a decent selection under £30 as well as wine by the glass and the half bottle. Mr W ordered a bottle of Verdejo Spanish white wine which was crisp, light bodied and fresh. 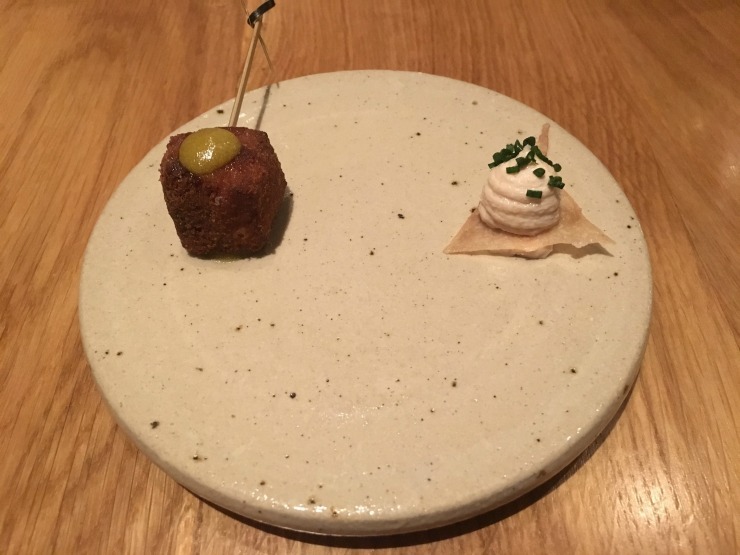 An amuse bouche was our pre-starter. A tasty morsel of ox, with a decoration of pineapple sauce, it was scrumptious. The chicken skin with cod mousse wasn't to my taste but the presentation was excellent. Mr W had a vegetarian amuse bouche, but he's a quick one so it was popped into his mouth before I could get my camera out. In fact, I must admit I don't have many photos of his food at all, sorry readers. My scallops were presented as a work of art. 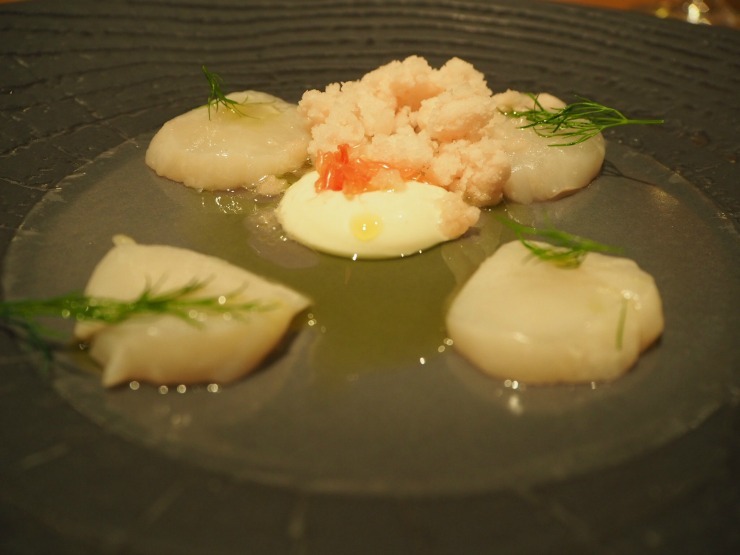 The scallops were raw, but were served with a citrus sauce, almost like a ceviche and was accompanied by a sharp refreshing granita of pink grapefruit and a dill mayonnaise which added a creaminess. Totally delicious. With the Ums and Ahs coming from Mr W, he obviously enjoyed his course too. My next course was a dish of tagliatelle. Now I'm not a huge pasta fan, I can take or leave it but this was so full of flavour, I think it was my favourite course. 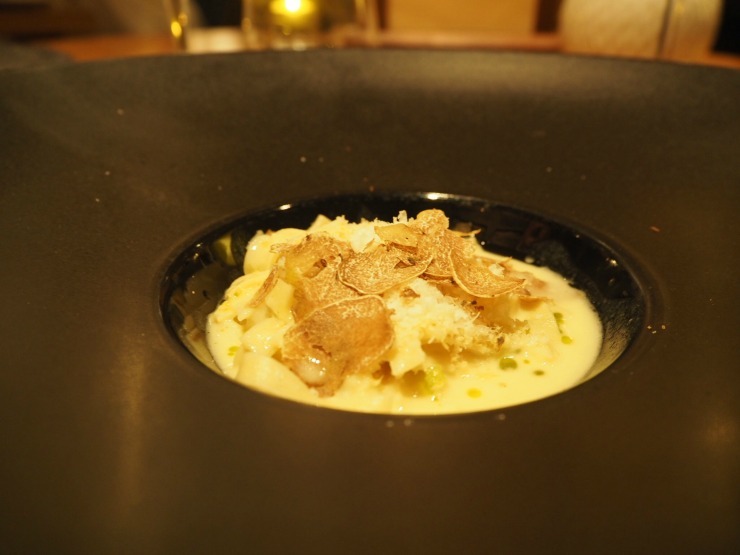 The creamy sauce was light and well seasoned and the dish was topped with generous shavings truffle as well as 36-month-old aged parmesan. 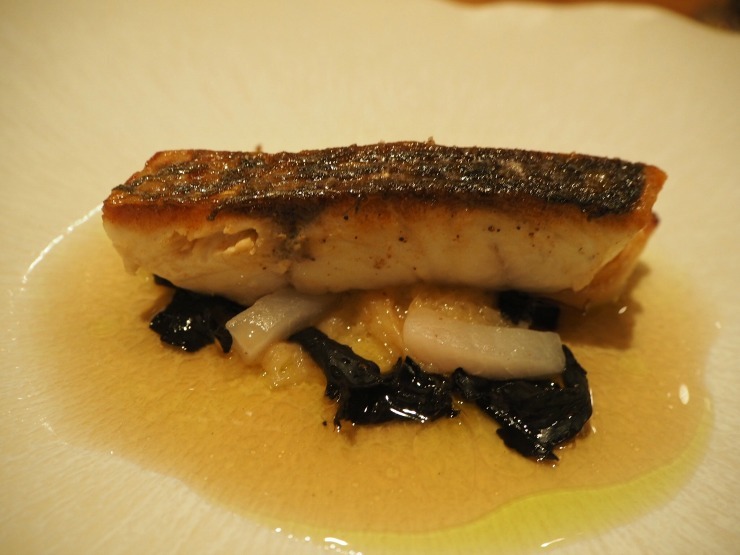 Next was a dish of stone bass. Served with a 'mushroom tea', the waitress had great delight with the ritual of pouring the clear consomme from a little teapot over the fish. The fish was cooked well with a crispy skin, and good seasoning and fell apart with a fork. At this stage, we were also offered bread. 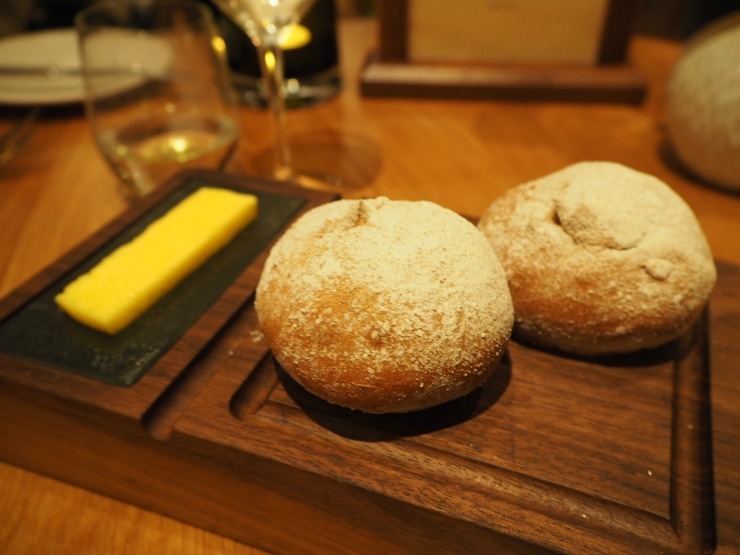 When it came the wholemeal bread rolls were warm and floury and really hit the spot when served with creamy salted butter. By this stage, we were starting to get full but we were looking forward to our 'main' course. The next course was larger than the others and was duck served three ways. This included duck confit, roast duck and duck pate. I enjoyed the confit of duck the most, whilst the duck pate was rich and smooth and the roast duck had Asian five spice flavours. Served with barbecue cauliflower which was quite smoky, the duck three ways was surprisingly filling and the addition of hazelnuts added a nice crunch. At this stage, we were offered a sweet wine to go with our dessert. 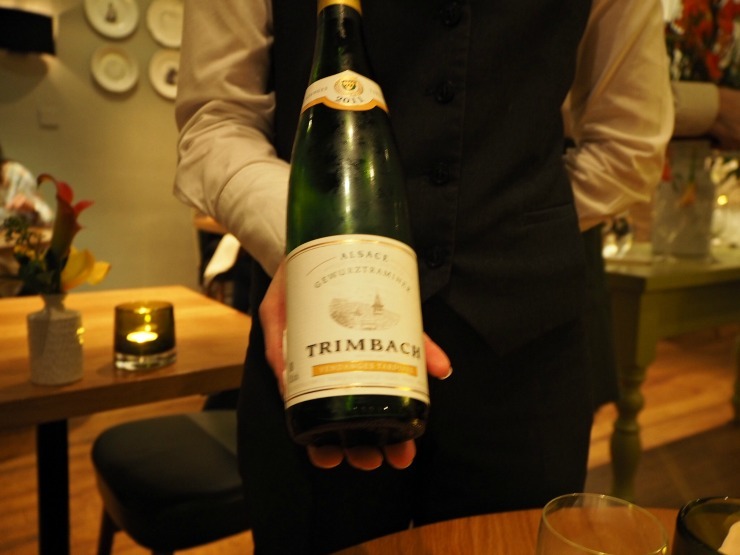 Casha the sommelier was very knowledgeable about the wine and suggested a glass of the Trimbach Gewurztraminer. This medium sweet wine had fruit, spice and honey notes and tasted very perfumed. Mr W really enjoyed it. I finished off the meal with baked milk chocolate, peanut brown butter ice cream and salted caramel. 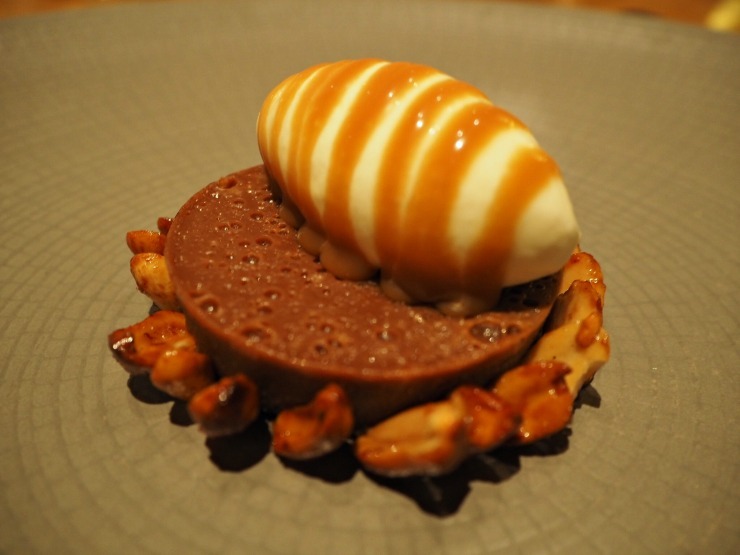 I love peanuts in a dessert and the sweet caramel flavours went exceptionally well with the chocolate too. 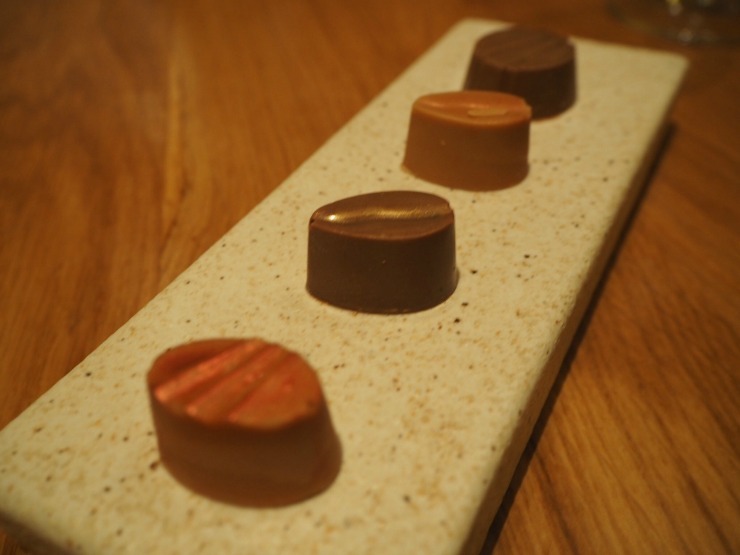 Our last course was petit fours, which were little delights of creamy chocolate. All in all our meal took over three hours but it was such a fantastic experience, especially for a foodie like me. Almost every single morsel was fantastic and I savoured the whole meal. 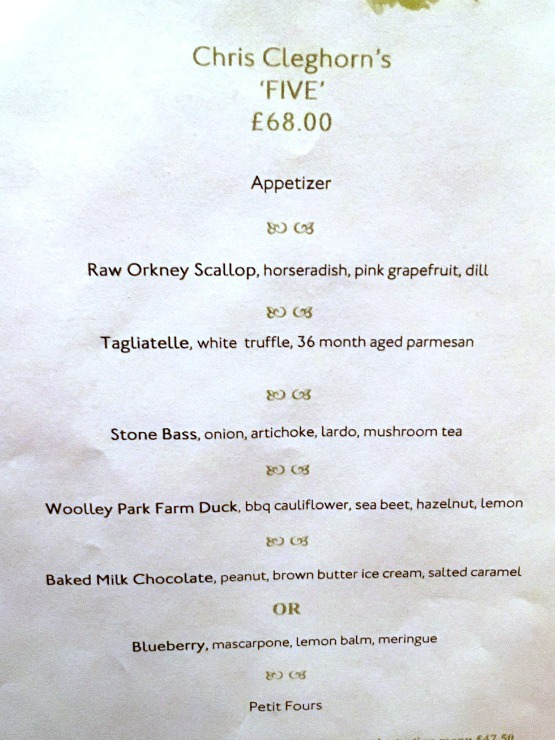 For £68 for five courses, I think it is excellent value for a one Michelin-star restaurant. The staff were attentive but never pushy, the environment felt special but not stuffy and the quality and flavour of the food were exceptional. So full, we retired to bed and had a restful nights sleep. The next morning we came down for breakfast. Breakfast the next morning was a relaxed affair. 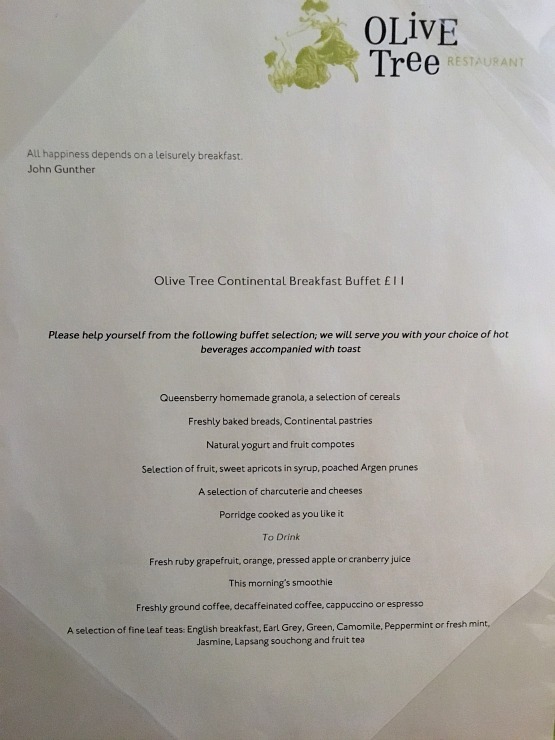 A selection of cereals, bread and pastries, fresh fruit, yoghurt and fresh juice was accompanied by a hot cooked to order breakfast. 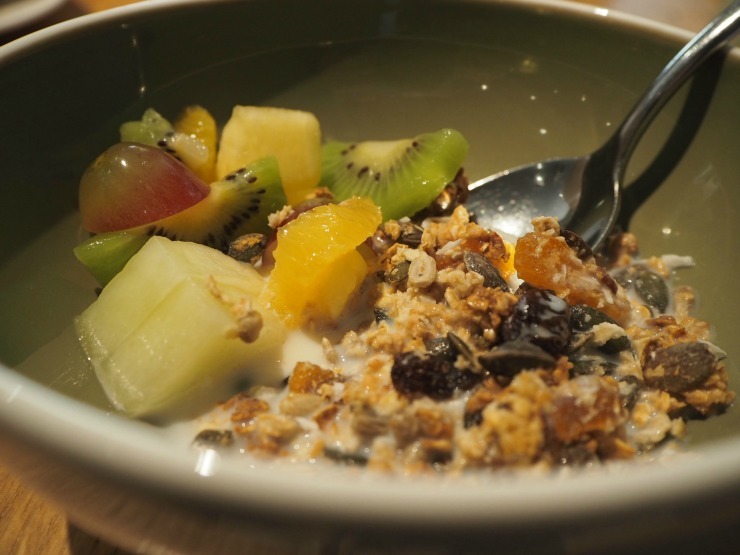 I liked the homemade granola and the fact that the juice was fresh - something you don't always get in a hotel. 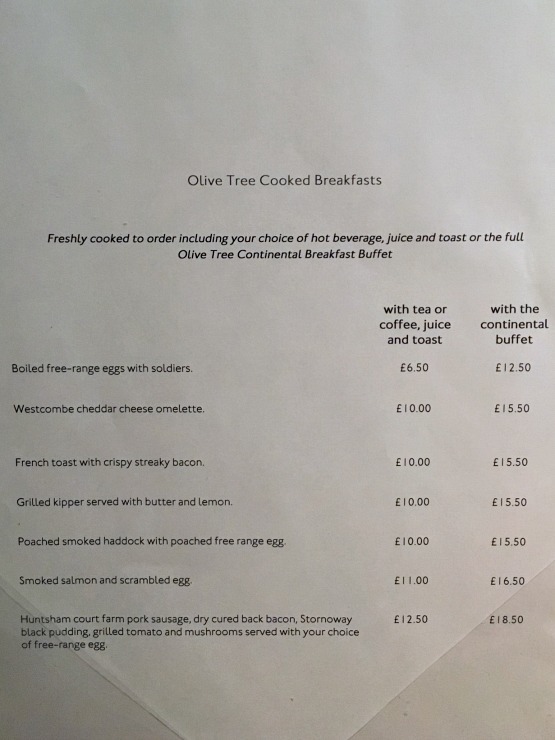 We ordered from the cooked to order menu - Marcus had a cheese omelette and I had something I haven't eaten in a long time - kippers. 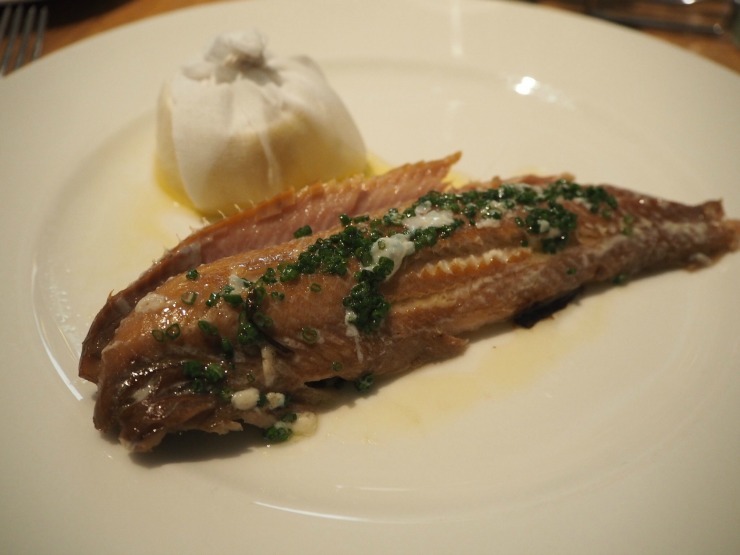 My kippers were perfectly done to order, drizzled with butter and herbs and served with a wedge of lemon, Very good indeed. 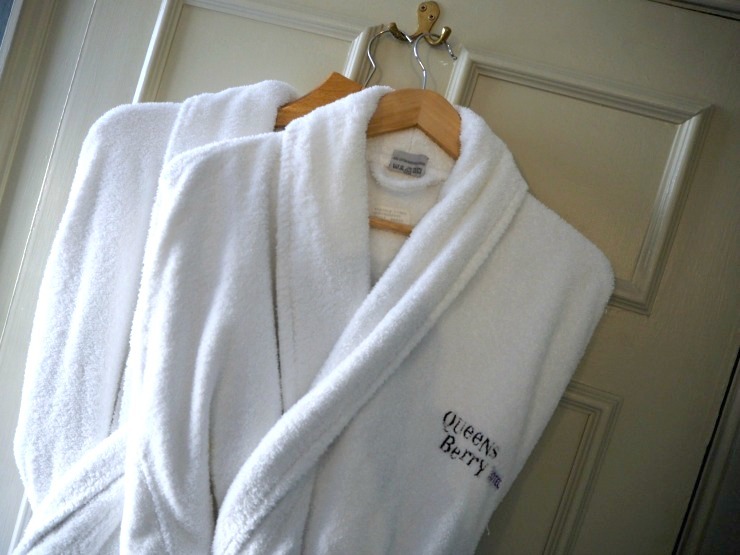 So it was time to pack our bags and leave the Queensberry Hotel. 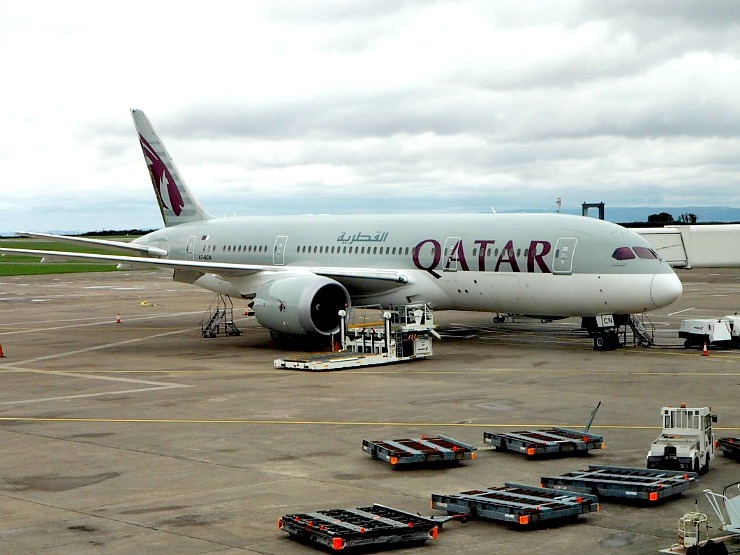 We were really sorry to go and we absolutely loved our stay here. 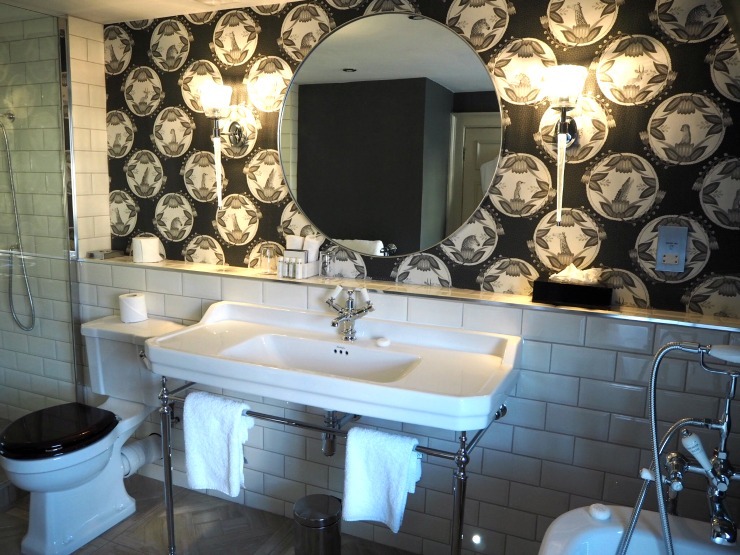 The room was spacious with a glorious bathroom, and the staff attentive and welcoming. 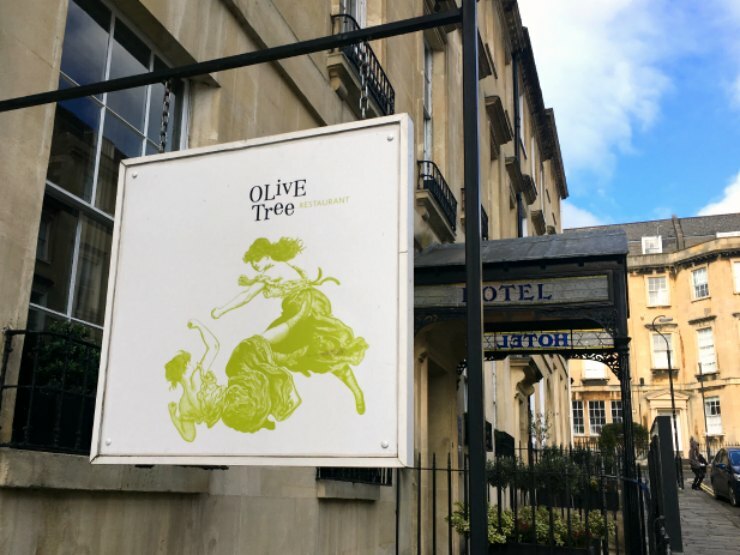 The position is also excellent for the centre of Bath and the icing on the cake was the fantastic food in the Olive Tree Restaurant. With rooms starting just under £100 a night, I think for this quality of hotel, the price is definitely worth it. We will certainly be back and we are planning to bring my mum here in the future. Check out this video Mr W made for our Fly Drive Explore YouTube channel. 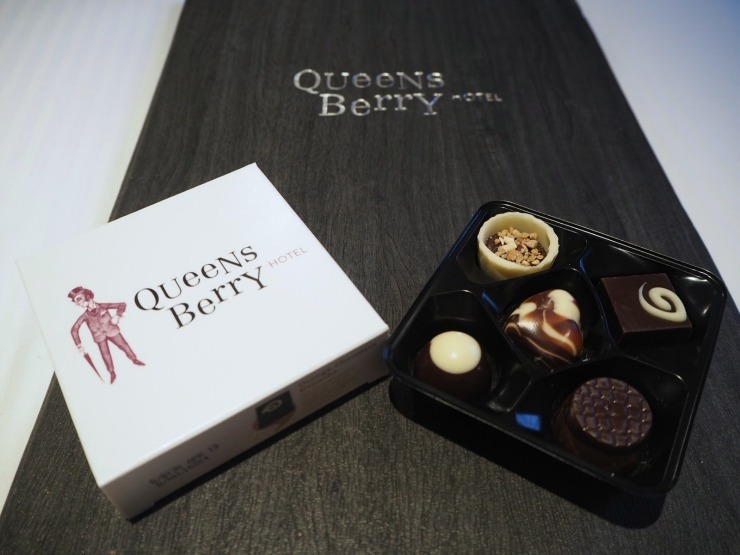 Did the Queensberry Hotel live up to my expectations? Most certainly. Highly recommended. 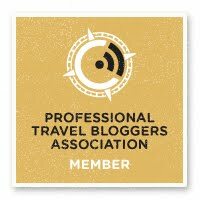 *We were given a complimentary stay in exchange for a review, as always all my opinions are my own. 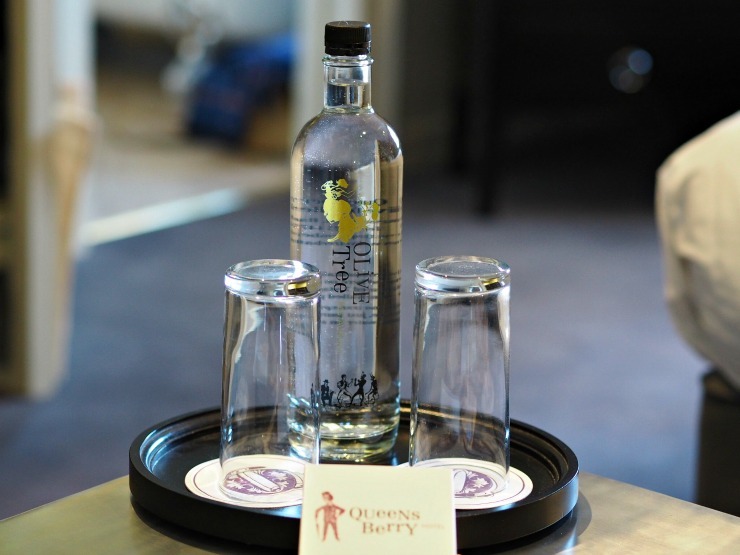 It's those extra little touches that make a hotel special. This place looks divine! 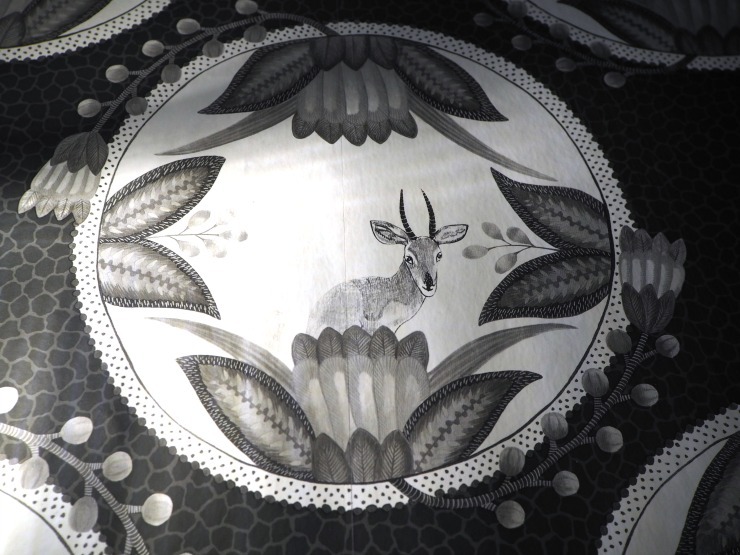 I especially like the wallpaper. I love that wallpaper too! Bath is fabulous, you need to treat yourself Dean! This all sounds so amazing. I agree Bath is beautiful however to have a hotel with such details makes it better. The restaurant food sounds delicious too. The restaurant was truly exceptional. I live near Bath and have often wondered what the hotel was like inside. I agree about Bath being good for tourists. I hope to visit the Christmas market soon. I've wanted to go to Bath for a while because it looks stunning. 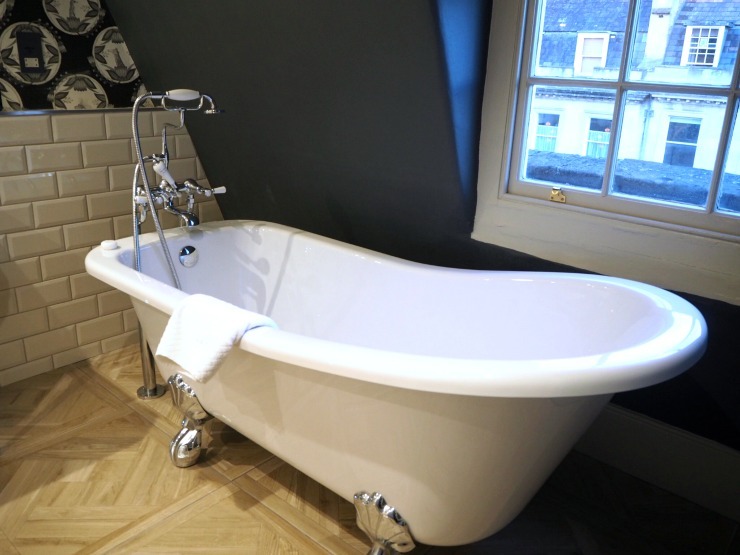 This hotel looks gorgeous too, a roll top bath is the dream! It was such a deep bath, one you can almost get lost in. I adore Bath. We had our mini moon there after our wedding and we love to go back. This looks like a lovely hotel and the food delicious. We haven't managed to visit Bath this year, I must make sure we do next year. 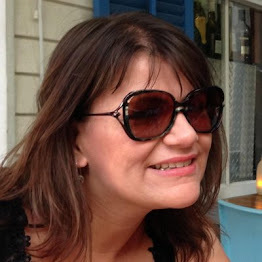 You must try and visit again soon Laura. What a lovely looking hotel. I really like the bedroom decor and that bath looks amazing. It was amazing to get into the bath after a long day. I’ve never been to bath (it’s always been on my list of places to visit). I love how spacious yet highly classed your room looks with that what appears to look like very cosy bed! It was a very classy room. Oh yes, that roll-top bath was just heavenly! This hotel looks amazing, that bath is the bath of dreams. The food looks so good and the price isn't bad for such a high quality restaurant. I think for what you get the price in the restaurant is great. Bath is glorious when the Christmas market is on Kara! Oh my gosh! Take me here. What a gorgeous treat to stay here. It looks lush! It is an exceptional hotel and the restaurant was amazing. What an absolutely gorgeous place to stay! Everything looks amazing. I would go back tomorrow. The staff were lovely and the food exceptional. I think it was the best Michelin star restaurant i've been to.